Fleetwood Mac News: Telling us lies, sweet little lies ? Telling us lies, sweet little lies ? Could there be some truth in them there tabloids!! Or are we being sucked into this gossipy vortex? Singer Stevie Nicks is reportedly recording a new solo album as a tribute to her late mother. Barbara Nicks died in Arizona at the age of 84, with her famous daughter by her side, on 28 December (11). The Fleetwood Mac star later spoke out about the devastating loss, admitting, "She supported me and all of my dreams. She was the one that made it all possible." And now the Landslide singer is set to remember her mum by composing a record in her honour, according to the National Enquirer. A source says, "Stevie always finds something positive in the worst situations, and no one's surprised at her decision to write a tribute album to her mum. 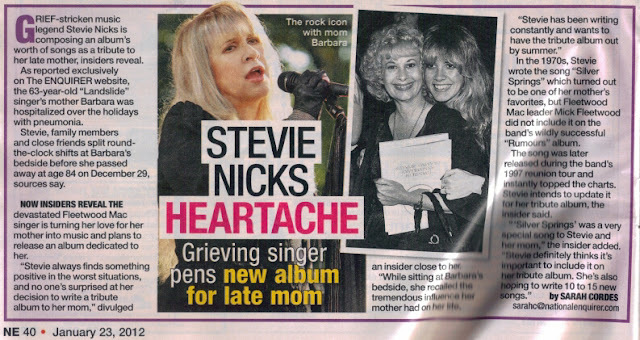 "While sitting at Barbara's bedside, she recalled the tremendous influence her mother had on her life... Stevie has been writing constantly and wants to have the tribute album out by summer." If there really is a tribute album planned, it would be great if Stevie teamed up with Lindsey. Apparently he loved Barbara and she always regarded him as ''the son-in-law who never was". I will believe it when I see it. Who knows though, maybe Stevie feels this way right now in the grips of her grief. But I would bet it never happens. And if it does, I certainly would rather someone else produce it than Dave Stewart. I must be in the minority, but I don't think he did such a terrific job on "In Your Dreams". Too many of the songs had almost the same tempo, he did not mix up the arrangements enough on most of the songs to even tell where the verses ended and which sections were supposed to be the choruses. And because of this none of the songs really sounded anything like a hit single. And Stevie or the Mac could still get a song on Adult Contemporary radio, middle of the road stations no matter what the doubters may say. Of course she would never make it to top 40 pop, but there are enough easy listening radio outlets nowadays to give her a hit. That is if a song is produced right. I agree with the post above, regarding Dave Stewart. There are some gems on the album and I have grown to love much of it. But I think she is capable of even more... would love to see her work with Rick Rubin or T. Bone Burnett and explore her rougher blusier side (with less glossy production). Not a chance in hell this will happen, especially not by summer. Poster # 3, I agree. Buckingham Nicks II has been long overdue, and I hope it happens this time, before the end of the physical world as we know it... this year. I love everything Stevie does because i Love Stevie as an artist. Of course I love would love for her to have a hit but its not the measure of her talent. Who cares what she wears or about what she is doing with her hair of whatever other other nonsense is going around. I hope that Stevie continues to make music because it is her gift and I believe its what her mother would what for her. I wish all the comfort that her songs have given me back to Stevie in her time of grief. If Stevie records another record It would be a blessing indeed! And this time around, more than ever before, Stevie will make the record on her terms completely and unedited. After the brilliance of IYD, and radio mostly ignoring her, along with other classic rock acts. Stevie is keenly aware she only has to please herself & her muse. This could be the most honest & breathtaking record Stevie undertakes. We can only hope there is a grain of truth in this unsubstantiated rumor. But it's totally possible. Review: Lindsey Buckingham "Seeds We Sow"